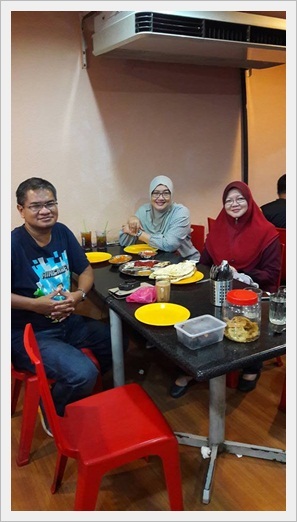 23rd MARCH 2018 ~ Another (mini) reunion took place during dinner with one of the classmates of UPM TESL class of 1993, Puan Mawarni Mustafa, who was accompanied by her husband. She could not make it for the gathering done earlier and it was kind enough of her who insisted to see us on the island despite her busy schedule. The meeting took place in one of the popular restaurants in Georgetown, Kapitan, with a huge neon signboard which claimed it served world class naan bread. 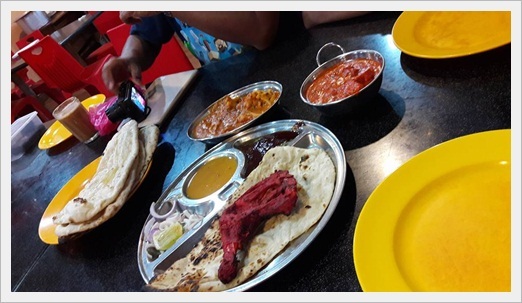 We made the right choice as we ordered three types of naan. At first I was shocked to see the size of the bread which was as big as flippers and had doubt we could finish them. However, we surprised ourselves as everything was successfully gobbled down. We needed to renew our energy as we had travelled thousand of miles just to get there. I would have to thank Puan Mawarni and the husband for spending their time with us. After not seeing each other for almost 25 years, I was glad I made the journey up north this time and got to meet many friends. Hoping this could happen again, later if not soon.